Once you sip the Nectar of the gods, there’s no going back. Leda Pierce is working as a paranormal bounty hunter on the Frontier, the dividing line between human civilization and the plains of monsters. Life is simple and the pay modest, but at least she has her family. That is, until a vampire hunt goes wrong and her brother goes missing, captured by the dark angels of hell. With no magical powers of her own and no way to find him, Leda’s only option is to go to New York and join the Legion of Angels, an elite unit of supernatural soldiers with powers gifted to them by the gods themselves. If she can survive long enough to make it up the ranks, she will gain the magic she needs to find her brother. But Leda soon finds herself on the wrong side of a conspiracy that will shake up the supernatural world—and at the mercy of a fiercely powerful and tempting angel. 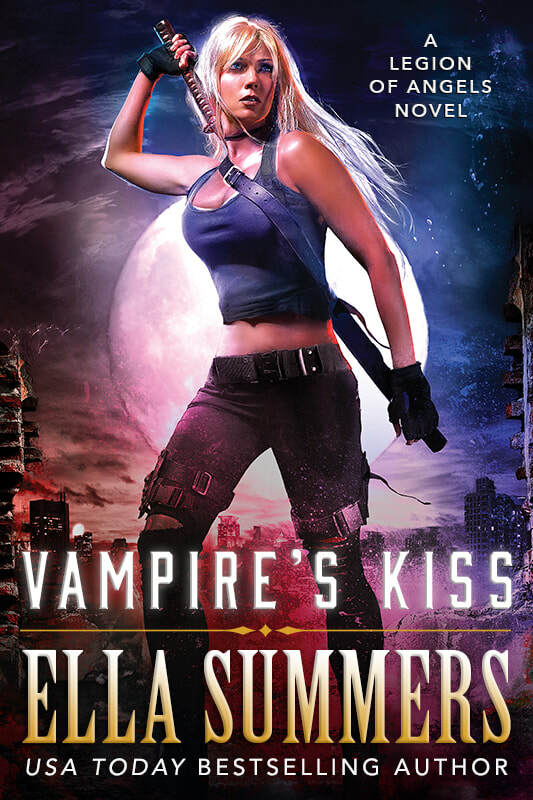 Vampire’s Kiss is the first book in the Legion of Angels series.